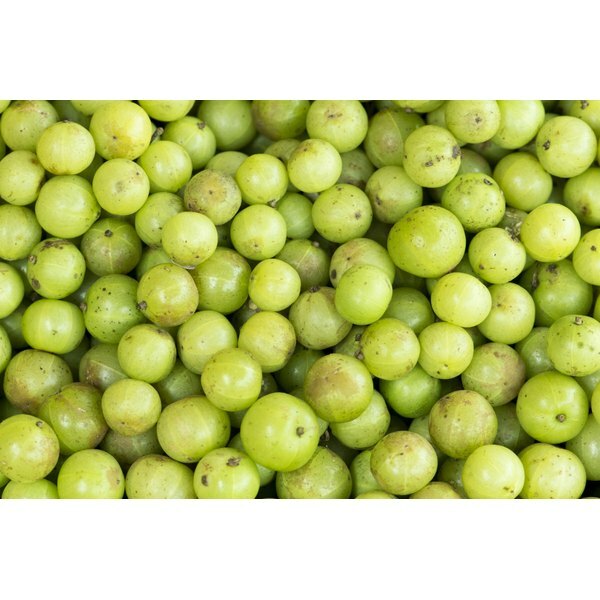 The amla fruit (E. officinalis), otherwise known as Indian Gooseberry, has a long history in Ayurvedic medicine. Thought to promote health and longevity, the fruit and its many preparations is classified by Ayurvedic practitioners as Rasayanas – plants used for purposes of healing, energy promotion and overall wellness. A variety of preparations exist for the tiny berry – most of which use the berry’s extract in one form or another – including extract fruit powder, paste, juice, dried whole berries and tea. As with starting any new treatment or alternative therapy, consult your health care professional first. There seems to be an opinion among the traditional medical community that the amla fruit has no place in modern medicine – that little evidence exists for the berry’s effectiveness and benefits for health. Research conducted within the last 10 years, however, paint a very different picture. In fact, the fruit's effectiveness has been proven when given in the proper dosage and preparation. Amla has been shown to hold a number of properties beneficial to health and wellness; for example, the fruit is a powerful antioxidant -- primarily due to the presence of tannins, which intensity the effect of its vitamin C content -- as well as a detoxifier and cleanser, antiseptic, and antitumor agent. When monitored by a physician or other medical provider, the fruit has been successfully used in the treatment of various conditions, including hyperlipidemia, atherosclerosis, diabetes, pancreatitis, various types of cancers and gastrointestinal disorders. If prepared correctly and given in the proper concentration, amla tea likely dons similar benefits to the fruit’s other preparations. Amla tea drinkers can likely expect increased energy, improved immunity, better digestive function, higher sleep quality and increased mental acuity. Commercially, amla tea is rarely available in its original form; most often, consumers can find it in a bagged version combined with other herbs and spices. These types, though they may claim to possess the healing properties of the whole fruit, are typically not high enough in concentration to affect health and wellness. Generally, these teas are less effective than other preparations, such as liquid extracts, solid extracts, fruit powder, decoctions and even traditional infusions. Your best bet is making your own decoction or infusion at home; simply combine the extract’s fruit powder with at least 8 ounces of water, or boil the whole fruit and add water as necessary. Sweeten with honey to finish, and you’ve got a pure, concentrated amla tea without any harmful or unnecessary additives. If you'd rather not make your own, fear not; there are a number of options for consumers in the market for high-quality, effective amla tea. Search for companies that offer consumer-ready information about quality control, preparation methods, purity and processing. In terms of teas, opt for the loose-leaf, organic version – more of the medicinal properties are maintained, and preservatives, pesticides and other harmful chemicals are avoided. If possible, purchase your herbs fresh; herbs devoid of the plant’s original scent and appropriate color are old and lacking nutritional and medicinal benefit. The best option for high-quality, medicinal amla tea is to purchase the fruit’s extract powder and combine with the recommended amount of water. This will undoubtedly provide increased health and nutritional benefit when compared to the commercially prepared, ground tea combinations found on the supermarket shelf. Searching for high-quality herbal supplements, no matter the preparation, can be time consuming and rather confusing, particularly if you are not familiar with the specifics of herbal and alternative medicine. When in doubt, head to your natural or whole foods store, or consult a professional in the field. Talk to your medical provider before you begin any new or alternative therapy. Amanda Relph is a professor of health sciences at Grand Canyon University in Phoenix. Her work has appeared the Online Journal of Health Ethics and Balance: Health and Wellness. Relph holds a Master of Science in health science with an advanced concentration in clinical bioethics. She is currently pursuing her doctorate in health sciences with a concentration in clinical competencies. Can You Cut the Bitter Taste of Tea With Baking Soda?